Preparations are well underway for the 37th Asian Racing Conference (ARC), which will be held in Seoul from May 13th-18th, 2018. Under the supervision of the Asian Racing Federation, The Korea Racing Authority will be hosting the ARC, which has grown into world racing’s largest bi-annual get-together, for the 3rd time with delegates having most recently assembled in Seoul for the 30th ARC in 2005. Earlier this week, the organizing committee updated on preparations at the International Federation of Horse Racing Authorities (IFHA) annual conference in Paris. The main Conference venue will be COEX in the Southern Seoul Business District although the week’s events will get underway at Seoul Racecourse on Korean Derby Day on the Sunday May 13th when in addition to Korea’s three-year-old showpiece event, there will also be a special ARC Commemorative Race. There will be various Bureau meetings on Monday 14th before the Conference officially opens that evening. This will be followed by three days of Conference proper. Delegates may then join an optional tour of the KRA’s breeding facilities on Jeju Island on Friday. Alongside the main conference, the 2nd International Forum for the Aftercare of Racecourses will also be held. 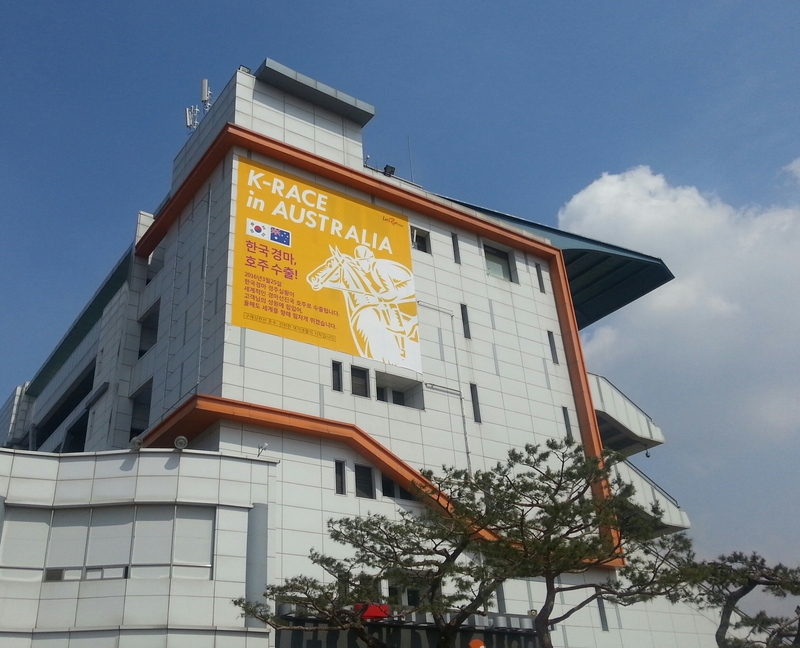 Korea will debut on Sky Racing in Australia on Friday with nine of the ten races on the card at Busan the card being shown on Sky Racing 1 (race 10 is available for betting only) as Australian racing takes its customary Good Friday holiday. 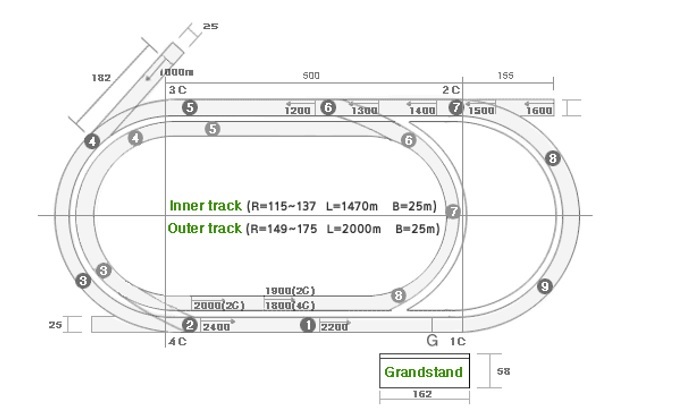 We’ll have a full race-by-race rundown here on Thursday but in the meantime, here are some very basic things to be aware of about racing at Busan. The Track: The track surface is sand. There is often a lot of kickback and as such horses tend to wear pacifiers and give one another plenty of room. Due to the nature of the surface, it usually runs quicker when it is wet. Races: 90% of regular races are handicaps. There are six classes in total with class 6 being for new or unrated horses. Horses then progress up (or down) the classes according to rating. Most horses are Korean bred although there are imports too. Imported horses all begin at class 4. Tab number and gate number are the same and jockeys wear a cap coloured according to their gate number (number 1 always wears a white cap, number 2 a yellow cap, etc.). Starts tend to be quick and most horses need to be on the pace early. Jockeys are not permitted to shift ground within 100M of the start and there can be quite a battle to find a forward position. Trainers: Kim Young Kwan has been the dominant trainer at Busan for some time with Australian Peter Wolsley generally the runner-up. There are two other foreign trainers at Busan; South African Bart Rice and Ireland’s Thomas Gillespie, who previously trained in Malaysia. Here is the 2016 Premiership so far (RSLW=Runners Since Last Win). Favourites: One plus of Korean racing is that favourites do oblige on a regular basis. In Korea, punters overwhelmingly favour exotic bets with the quinella and trio being the two most popular. The win and place pools are comparatively tiny and while they will generally be accurate in terms of who is faovurite, they may not tell the whole story the further down the board you go. General: Prize money is high and integrity is good. Betting pools in Korea close 30 seconds ahead of the advertised start so races usually jump exactly on time. Tomorrow (Thursday) we will run through all ten races on Friday’s card. On Saturday we will focus on Seoul in advance of Sunday’s races. What Have We Learned From Success Story? Success Story brought the Korean adventure at the Dubai World Cup Carnival to a successful conclusion with a rousing run behind California Chrome last week. A second front-running performance and gutsy finish under another flawless Tadhg O’Shea ride, meant he landed back to back 3rd place finishes, this time in one of the most widely watched races of the Carnival so far. The decision to run in that race was not without risk. Although Success Story had won at 2000M before, he is considered to be much better at shorter distances and accordingly was also entered for a 1400M race the same night. However, with California Chrome scaring off a number of potential rivals and jockey O’Shea expressing confidence in the horse getting the trip and being competitive, the decision was made to take a chance at the greater distance. And it was a decision that paid dividends with Success Story’s front-running and then gutsy rally to get up for 3rd place earning him plenty of praise. Of course, California Chrome was much better – he finished four lengths ahead of Success Story but it could have been forty had Victor Espinoza been so inclined – putting in a performance judged to be the best in the world last week. The wider significance is that for the second time, Success Story looked like he belonged in the race. It’s true that just as when finishing 3rd of 14 last month, he was racing against horses, Chrome aside, who are no more than solid handicappers but until last week, not many would have thought a Korean bred and trained horse could cope with even that level, let alone beat the majority of his competitors. He vindicated the decision of the Dubai handicappers to invite Korean horses and has ensured that a return trip next year – either for him or for others from here – is very much a possibility. Success Story took to Dubai very well. He reportedly enjoyed the stables, the routine of the lengthy walk to and from trackwork each day and the dirt track itself, as well as the general environment. At the races, he looked so much better than he generally does in Korea, having been turned out beautifully. He looked like a racehorse. His groom led him up in a shirt and bow-tie and his connections – it seemed as though the whole family was there – were dressed up as if for Royal Ascot. In Korea, the grooms tend to wear Union issued t-shirts to the parade ring; except for big Stakes races, 90% of trainers don’t wear anything different to races than they would wear around the barn and owners rarely leave their lounge (although Busan is generally much better than Seoul in this regard, especially when their horses visit the capital). Owners will from April be permitted to have their horses run in their own colours rather than those of the jockey. With the current drive by the KRA to reboot the image of racing in this country, it would be very welcome if this was accompanied by a little more sophistication in the raceday experience. The most important thing of course is that he ran well, exceeding the expectations of the most optimistic observers. O’ Shea deserves great credit for extracting the very maximum out of him on both occasions but he was well trained and well entered too. Mainstream Korean news outlets carried reports on the two races while the California Chrome factor ensured Success Story was mentioned in global coverage of Thursday’s race. Success Story wasn’t the only Korean-trained horse at the Carnival. Sprinter Cheongu was actually considered the more likely of the two to be competitive. His best run prior to Dubai was a 3rd place behind Choegang Schiller and El Padrino in the Asia Challenge Cup in Seoul last August and the knowledge that he would travel fine, having previously taken trips to Singapore and Japan in his stride, meant one less thing to worry about. It was not to be. On opening night, he missed the break and then lost a plate. In such circumstances, running 5th of 8 was creditable but a lackluster performance last Thursday was less easy to explain away. He’s done his bit over the past few months but this time, he just didn’t run very well. Seven and a half years ago, I wrote an article called “What have we learned from Pick Me Up?” The answer then and for several subsequent years was “not a lot”. Pick Me Up was the first horse to go on what was a well-intentioned but ultimately counter-productive initiative to let Korean-bred horses race in the United States. It inadvertently became an incentive to ship horses that may otherwise have been spelled, to an unfamiliar trainer to participate uncompetitively in three races for which a subsidy was provided. Essentially, the wrong horses went to the wrong races at the wrong time and it was still continuing up until last year. By contrast, the interactions with Japan, Singapore and now Dubai are much more positive. With connections being invited to target a particular race, the trainer is still responsible for training the horse, the grooms go with the horse and everybody involved is invested in the trip being successful. So “What Have We Learned from Success Story?”, the answer now might still be “Not a lot just yet” but with the caveat of “Watch this space…” The prospect of more nights like last Thursday are a huge incentive to keep trying.